Hi, and welcome to my stop on the blog tour for Cheyanne Young's Motocross Me, hosted by Itching for Books! 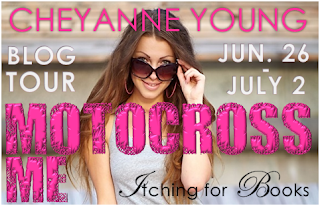 I've got all the info on this motocross book and its author for you, as well as an excerpt and giveaway. Be sure to check it out! The next truck pulls up and I ready my clipboard. It's an older Mazda with faded red paint and a blue dirt bike in the back. Shiny decals on the bike's number plate read 336. The guy driving is about my age. He would fit in perfectly with the hot motocross guys if his hair wasn't a foot long and dread-locked. It makes him look wild, like someone who frequently breaks the rules and doesn't care. A white grease-stained shirt and board shorts complete his look. It is the exact opposite of Ryan's clean-cut, designer label, you-can-bring-me-home-to-mom style. He takes the clipboard and signs it in two places. "Good morning." He hands it back along with money. "Hana Fisher, right?" His teeth are remarkably white when he smiles. Maybe it's not a bleach thing. Maybe there's something in the water that gives Mixon boys great smiles. "Yeah, something like that," I say, bored with small talk. I'd spent the entire morning confirming my name to people and talking about my black eye and stupid things like the weather, or how exciting it is being at the races. All he needs to do is sign, pay and leave me alone so I can discuss the same thing all over again with the next person in line. "I'm paying for me and the girl in the car behind us," he says. "That's nice." I glance toward the blonde he's referring to. "Girlfriend?" "Sister actually, but she costs as much as one." He laughs as he leans forward and shoves his wallet back in his pocket. "I'm Ash, by the way." "Nice to meet you." He shakes my hand and flashes me another smile so wholesome, it makes all my visions of him robbing a convenient store seem unrealistic. He drives forward and I wave the girl through, wondering why dreadlocks have such a stigma about them anyway.